I like to be able to rotate my artwork as I am an artist, so this is a perfect solution. Good quality and love the black. 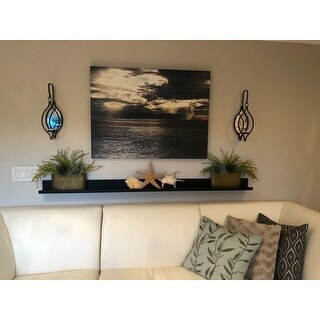 Display favorite family photo frames or canvas art in style with this black decorative picture ledge floating wall shelf. A sleek edge on the front of this decorative shelf is designed specifically to support picture frames. 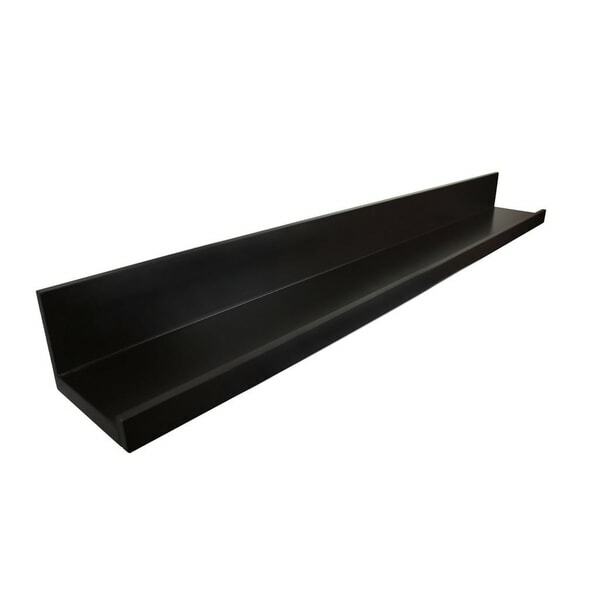 This handsome black decorative shelf will look great in any room of your home. Installation tip 1: for a sturdy installation, install at least one side of the wall shelf into a wall stud, as shown in the instructions. Installation tip 2: use the drywall anchor installation method to mount the shelf if you cannot locate a wall stud. Installation tip 3: make sure the arrow on the hidden metal bracket is pointing up. Durable MDF construction meets new CARB standards. Dimensions: 3.5 inches high x 72 inches wide x 4.5 inches deep. I used the 72" and 36" for a gallery wall and love the outcome! Easy to install. I ordered two of these shelves to display a clients family photos. They were the perfect size. I installed them myself with no problem. I gave it four stars because it did nick easily. I used a furniture marker and it worked great. Would buy again. Love this shelf. 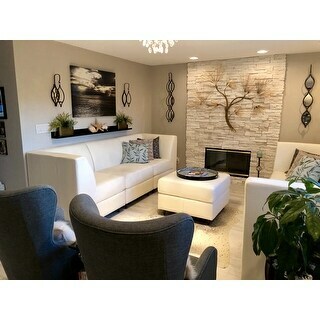 Looks great to display large picture frames on. Looks like something from pottery barn. The screws aren’t 16 inches apart for studs but i put it in one stud and it’s secure. This shelf is so modern and well made. It was easy to install. love this shelf which I hung in my bedroom to hold pictures of family and friends. I liked it so much that I bought another one and lined it with pictures of places we traveled. Each day when I get up, I am reminded of the people and places I love. Love this floating shelve !!! Its just what I have been looking for and the size and quality is bar far one of the best I have seen. I put it in the hall way and can place all kinds of artwork/family photos etc. with out having a million nail holes in the wall. I highly recommend this product. This price was also amazing for the size. Thank you Overstock! Love this shelf! Easy to put up with the included hardware. This shelf is sturdy enough to hold all of your Overstock accent pieces. Very pleased! This shelf looks so beautiful with my framed pictures on it in my office! I JUST LOVE IT! These are really great! I looked for a long time for a long ledge like this, a nice looking affordable one was hard to find. I am a painter and need long tasteful ledges to display my smaller paintings in my studio. The ledge is wide enough for deeper canvases and can layer several panels ...very versatile. I am hoping to order a few more for the living room bc I like how easily you can change the look and layers. Hard to find 72” photo shelves worked. However we bought two to put one of top of the other. The holes were not in the same locations on both shelves. This was a drilling nightmare. This picture ledge is simple and sleek. It's lightweight but sturdy to hold heavy frames. I would give it a 5 star rating but one corner was damaged (probably dropped during shipping). It is suitable for our needs. "How many pounds will this shelf hold? "